The aroma from an unlit Mi Barrio was stunning. If my eyes had been closed, I might have believed it was a crème de menthe thin mint near my nose, not a cigar. As perfume makers and aroma therapists can testify, smell is a powerful sense. It’s also one that many of us don’t employ enough when we enjoy cigars. Since that recent encounter, I’ve tried to be more conscious of the fragrance of cigars before I smoke them. Most cigars have at least some aroma from the wrapper, the foot, or both. But there’s extraordinary variety, and, interestingly, I’ve noticed some significant differences among cigars from the same line. For instance, I’ve had a 601 Blue, a maduro with a Nicaraguan wrapper, give off a thick chocolate fragrance and I’ve had another stick from the line present almost no aroma at all. On the other hand, some smokes seem remarkably consistent. I invariably inhale the smell of nuts whenever I take one of the Padrón “Thousands Line” in hand. Another curious aspect is that a lack of pre-light aroma doesn’t indicate lack of taste. I’ve found virtually nothing emanating from the extremely tasty Cabaiguan. 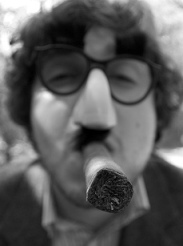 I know there are smokers skeptical of those who detect different tastes in cigars. But it would be hard to argue there isn’t a wide spectrum of aromas from the wrappers and fillers of unlit tobacco. Does anyone think a Cuban Cohiba and a Marlboro give off the same air? If you don’t regularly check your cigar’s aroma before lighting up, give it a try. And if you do, let us know what you find in some of your favorites. To me, cigars are a total sensory experience…it begins with how it looks to the eye, continues on through how it feels to the touch, and how it smells before you get to how it tastes. Is taste most important? Sure. But smell should never be discounted. My favorites out of the cellophane? 601 Red, Cubao…there have been some others that hit me strongly, but I can't remember specifically which ones this early in the morning. To me, it comes down to a larger issue of cellophane or no cellophane. Cigars that ship sans cello almost always arrive at home with very limited aroma from the wrapper (although there is usually some on the foot). When they ship in cello, the oils are concentrated and the aroma is much stronger. I've taken to saving my cellophanes so I can put them on cigars that I buy that don't have it…it preserves the aroma and it provides some protection from wear and tear and the cigars move around in the humi. Again, you are making a good point, as is dmjones: to enjoy the whole process: the appearance, the fragrance, etc. Some ugly-looking and/or smelly cigars taste great; some beautiful-looking and/or fragrant cigars don’t; etc. Makes it interesting. My favorite sans cello cigar aroma has got to be La Flor Dominicana Ligero Cabinet Oscuro. It has the most mouthwatering rich chocolaty smell, that even surpasses the 601-Blue mentioned in this article. You have to let them rest for a while in your humidor though, as they tend to be a little harsh if smoked right off the truck.